There is a sign at my hairstylist that says: "We fix $6 haircuts." Sometimes I feel the same way when I get a call that goes something like this: "We tried setting up Salesforce ourselves a while back, and well, it didn’t go anywhere." It’s uncanny that I usually get these calls right after the company receives their annual renewal invoice from Salesforce. A phrase that I’ve heard many times before, and one that recently was echoed on Forbes by Gene Marks: "Our CRM system? It’s nothing more than a glorified rolodex!" As the article rightly points out, it’s not the CRM’s fault – it’s how it was implemented. Does this scenario sound familiar? You’re biggest customer calls asking what’s going on with their quote but the Account Manager who owns the relationship is on vacation. You log into Salesforce.com so you can start picking up the pieces and you find – well, nothing. No logged calls, no emails, no notes or attachments. One of the big value points of a having your business set up on a CRM is to be able to track in one place all the interactions you have with your customers – whether from marketing, sales, customer support, or even accounting. If you’re not seeing activities being recorded on your customer records, that’s a big red flag you’ve got a problem. 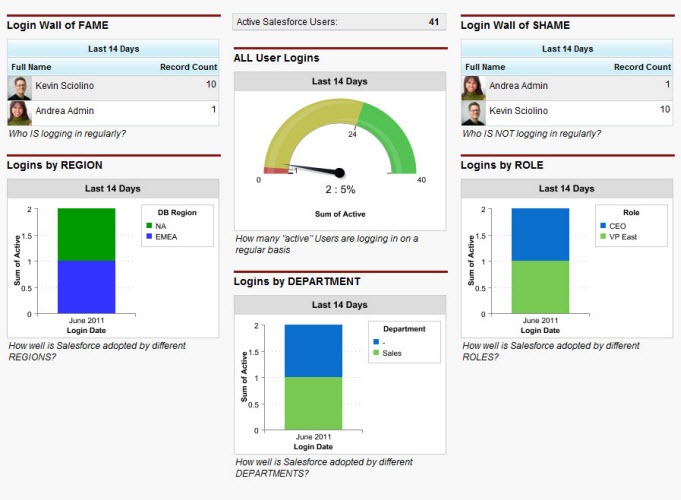 Analytics (Reports and Dashboards) are one of my favorite areas of the Salesforce platform. In the last couple of years Salesforce has really worked hard to make it best in class. If you’re not monitoring the pulse of your business with dashboards, and looking at them multiple times a week, you’ve missed one of the biggest benefits of having a CRM. When I’m looking at someone’s org to see if they need a "tune up," I look to see if they have created any custom dashboards, and if so, when was the last time they were refreshed. If it’s been more than a month, then the metrics on the dashboards are either not the right ones to track, or worse, the records that drives those metrics are not getting maintained (so they have little to no value). I’ve blogged before on how crucial adoption is to a successful CRM implementation. Salesforce has an "Adoption Dashboard" that does a fantastic job of giving you a snapshot of user behavior: are they logging in, creating records, and generating activities? Can’t find your Adoption Dashboard? You can download a set from the AppExchange for free. 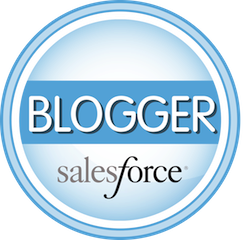 Bottom line, you need to know if your users are regularly in the Salesforce.com and are creating and updating their records. Leads with a Lead Source of "Referral"
When I log into a Salesforce org and I only see the "out of the box" views (e.g. My Accounts or All Opportunities), I know users never got trained or the client never stumbled on this little gem of Salesforce usability. Without utilizing Views, users are working entirely too hard to find the records the need. A dead giveaway that Salesforce never was setup correctly can be found by looking at three fields in Salesforce that define business processes: Lead Status, Opportunity Stage and Case Status. 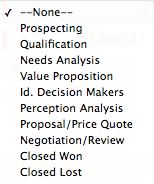 One of my favorite "out of the box" opportunity stages that Salesforce puts in a fresh org is "Perception Analysis." I love asking a client how they use that stage and what it means to them – it usually elicits either a blank stare or a very creative response. Salesforce should support your business processes – how you market, sell and support your customers. Using the business processes that come pre-defined in Salesforce are probably confusing your users and making a lot of your reporting inaccurate. If your company would like assistance re-implementing Salesforce.com, please contact our Dallas office – we’d love to help you get back on track. We specialize in small to medium businesses.